The things I love most about fall are all things that I think everyone can agree with: warm drinks, the changing leaves, cozy sweaters, cute boots, and pretty scarves. Colorado always seems to hit fall earlier than my home state of Texas, but I never complain because it is the best season out there. 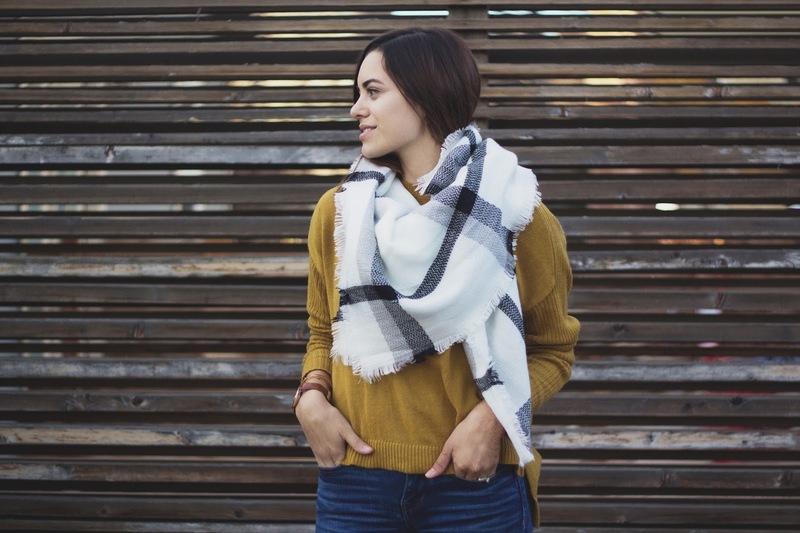 Let's talk about this blanket scarf, which is only $18 with free shipping. Ladies, that's kind of a big deal. it's large and warm which meant I didn't even need a jacket when the sun went down because it was so comfy. Even Ryan-Kate loved it! I forgot her socks in the car, and because the sun goes down so early now, she was starting to get cold in her dress with no tights or socks. She wrapped her hands around the scarf and squealed; it was adorable! If you'd like one for yourself, go to my Instagram account to enter to win a gift card from The Style Market Shop. The rules are simple, just follow me, @lunasallett and @thestylemarketshop, and for extra entries tag a friend who you'd love to win, too! HURRY, because this giveaway will end Sunday, November 20th. Winner will be picked and announced on Monday. While you wait, check out The Style Market Shop on Instagram or their website HERE.